Whatever the brand, what matters is the quality and the speed of the printouts. You must understand what you need in an output device to make the correct choice of the best equipment for you. This is one such device that produces excellent office documents. It comes with value-added functions which include: mobile printing from a tablet, laptop or a smartphone; duplex printing to save on costs; USB and wireless connections to handle all network related printing. Other additional features of this printer include an all-in-one machine that can print, copy, fax and scan. If you want to print from a memory card slot then you just need to insert it on the memory card slot then use the LCD touch screen to complete the function without connecting to the computer. It is a cost saving equipment due to the toner settings that allows you to use minimal toner hence printing many papers with the same cartridge. The device supports both color and black printing at a different speed, 9.3 ppm and 15.0 ppm respectively. The fax function can handle up to 3 pages in a second and storage numbers of up to 100 in addition to its memory of up to 180 pages. 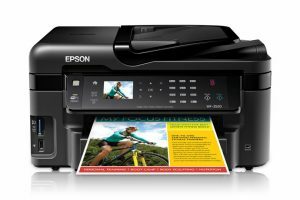 Epson WorkForce WF-3520 Printer Driver is licensed as freeware for PC or laptop with Windows 32 bit and 64 bit operating system. It is in printers category and is available to all software users as a free download.